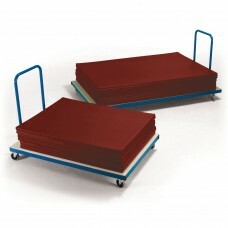 Manufactured from tubular steel with non marking swivel type castors, two of which are braked. 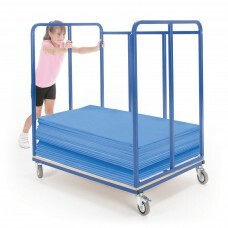 Holds over 100 aerobic mats.Dimensions : 1100mm long x ..
At last, a mat trolley that is robust enough to stand up to the toughest conditions. 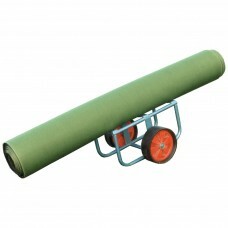 Constructed from 40mm sq section polyester painted steel tube th.. The red folding handle on this inclined vertical trolley holds mats firmly in position and the back support is angled for extra support. 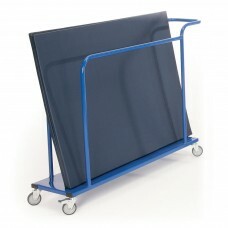 Suitable for..
A junior version of the Vertical Mat Trolley, this 1235mm long(including handle) x 350mm wide x 980mm high trolley has a single carryin..
An attractive 1790 x 450 x 1120mm (5’10” x 1’6” x 3’8”) high blue polyester painted steel unit fitted with a covered deck area and four universal cas..